August 10, 2016 By Chelsey 4 Comments This post may contain affiliate links. Read my disclosure policy here. I’m so excited to announce another quiet book!!! 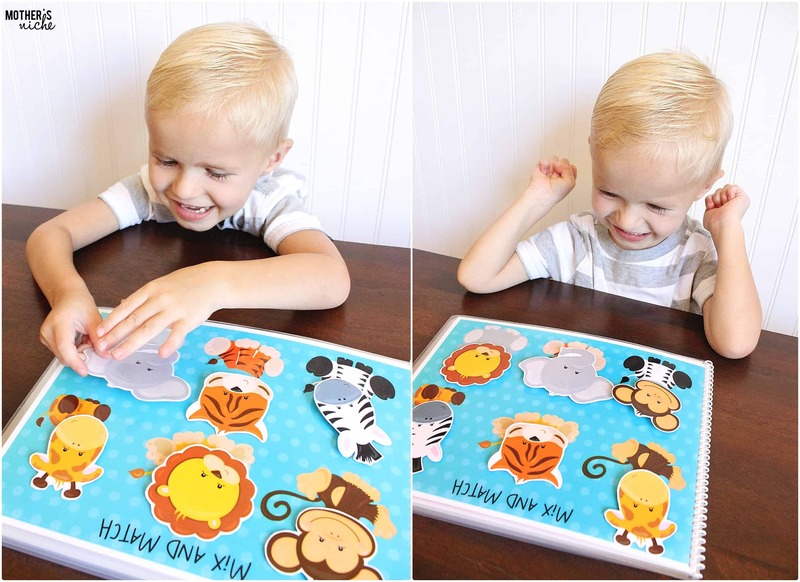 It’s “zoo” themed and it’s adorable! 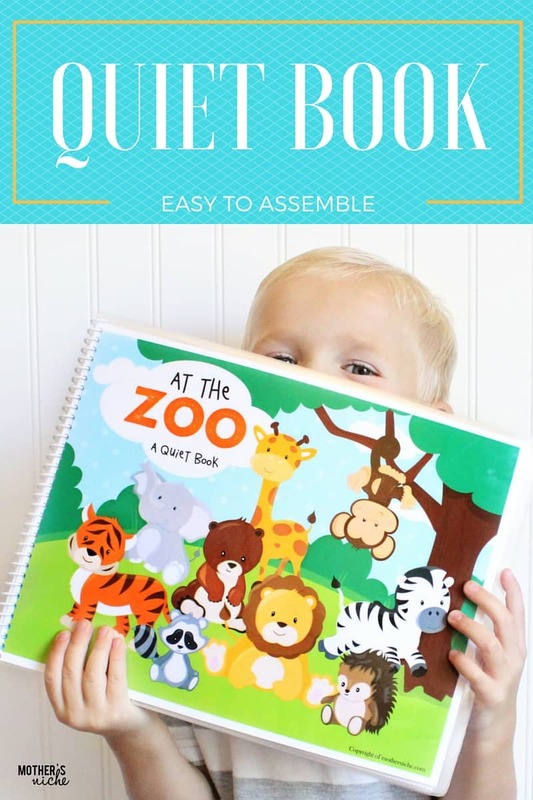 If you haven’t assembled my previous printable quiet books, go check out the video tutorial before you start! 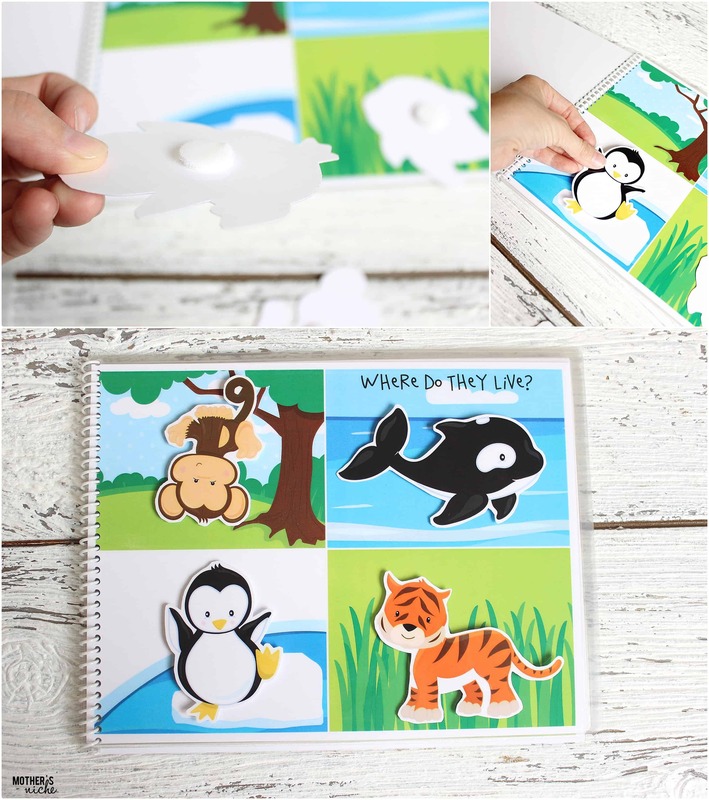 The book includes 7 interactive pages and 42 pieces to teach hand to eye coordination, shape recognition, colors, patterns, animal recognition, animal habitats, problem solving. And it all this learning happens without them even knowing it! I am all about fun, stress free learning. The amount skills that they learn depend so much on parent involvement. After going through the book just once with my three year old and asking him 2-4 question on each page he blew me away! 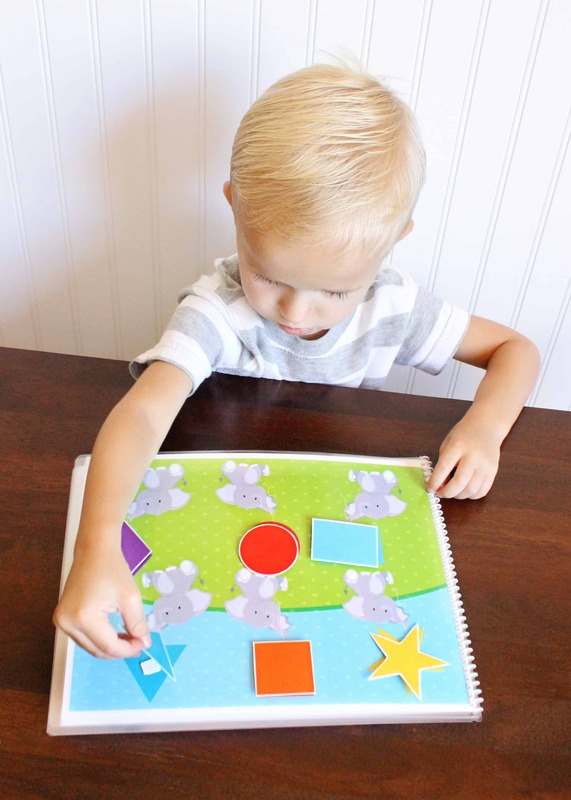 With counting and animal sounds, colors and shapes. The next time around he was playing teacher. “Okay, Mama. You tell me the animal and the noises he makes.” And ” which one is Orange, Mom?” What? Little smarty!!! Their little minds are incredible! A Walk through the ZOO! I printed each page on card stock, then laminated each page as well. After cutting out the activity pieces I attached both sides of the adhesive velcro to each piece. That way when I place it on the page right where I want it, it will match up just right each time. Much easier than eyeballing the center of the page each time. Learning about animal habitat. I asked my son why the tiger why he cant live on the ice. He told me they would slip around and would drowned if they fell in the water. I asked him why the whale can’t live in the trees. He told me he would break the branches. Haha! After a good laugh we talked all about why animals live in certain environments. Recognize animals and other shapes with out all the colors, patterns, and faces is an important part of learning. Some questions you could ask are: How did you know it was a giraffe? Which animal is the tallest? the smallest? which has a long nose? A long tail? Which animals run fast? Matching shapes is the first thing you see when you see this page. But there is lots to learn from these elephants. Talk about the shapes. Ask which one has 5 points? Which has none? What shape is red? Which one looks like a kite? Which one looks like a ball? Practicing colors and names of shapes can be fun! Aren’t those babies adorable? 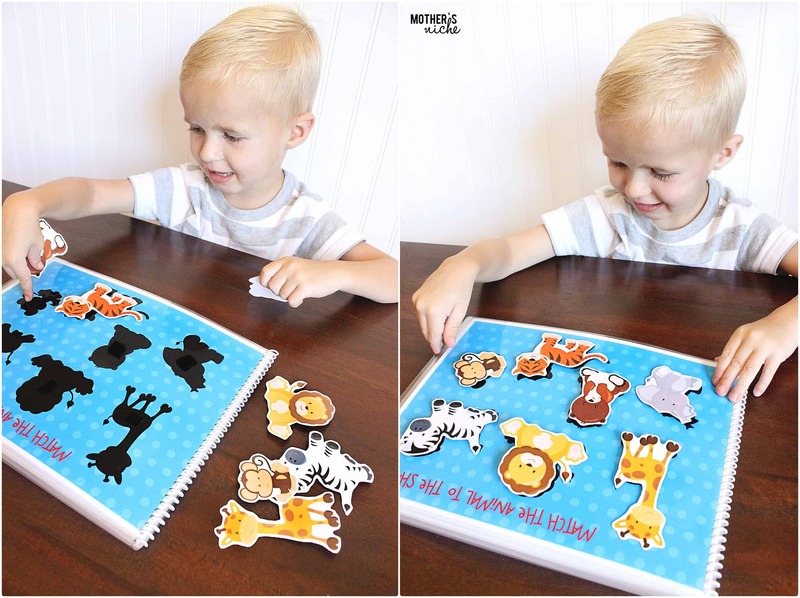 Pull all the baby animals off the page and set them on the table. Immediately their little minds start recognizing similarities in colors and patterns. As they match them up and ask what noise the animals make? What colors do these animals have on them? This page is great for counting practice and number recognition. Infants start counting outloud at a very young age but introducing them to what the numbers look like a more difficult to learn. I Have my son trace his finger along the number and say a little rhyme. 1- A straight line from top to bottom, the number one is awesome. 2- Around the back to the railroad track, two two! 3- Around the tree, buzz like a bee, this is how to make a three. 4- Down and over and down once more, that is how to make a four. 5-Straight live down then around. Hat on top my fives a clown! Isn’t this such a cute puzzle!?! I am in love with these animals. Note: When cutting out the puzzle pieces make sure to cut right on the thin white line to ensure a perfect match. Also assemble each page completely before binding it to make sure that all the pages are all right side up. I didn’t assemble my book at the time of binding and I made my puzzle upside down in my book and had to make a new page. Oops! How to get the MOST out of your Book! 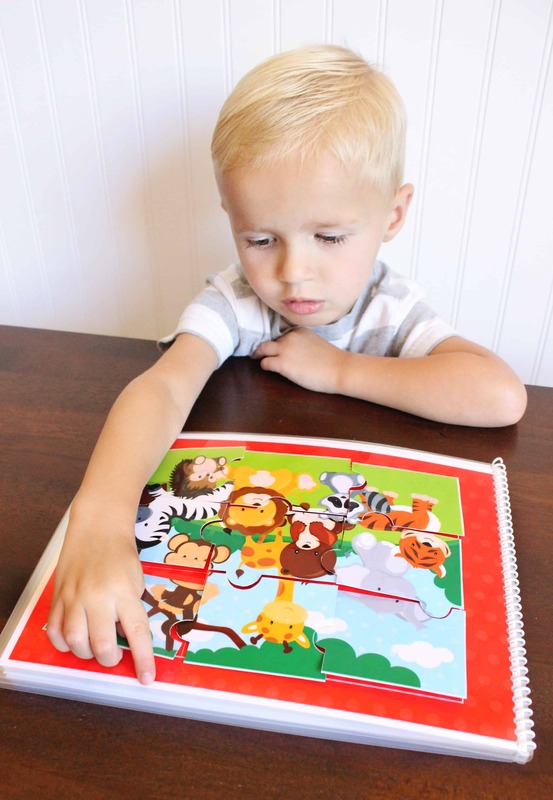 Just like any book your child will get the most out of it if you interact with your child! Ask questions??? Lots and LOTS of questions! What sound does the lion make? Which animal is the biggest? the smallest? Which one has spots? Stripes? Which animal is grey? Yellow? Orange? On this page… I Spy something that is brown. Or striped. Or Climbs trees. 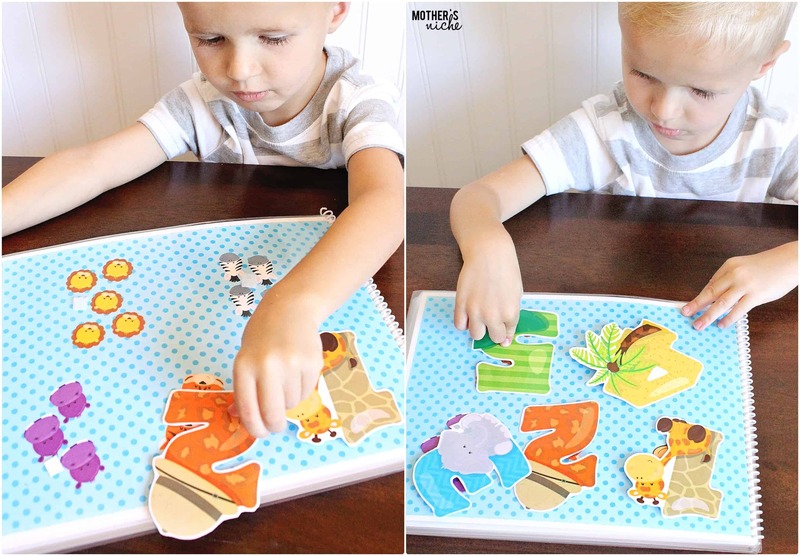 Beyond just the counting page ask your child to count the animals, the shadows, the giraffe spots, the clouds. What is the first sound in TIGER? MONKEY? 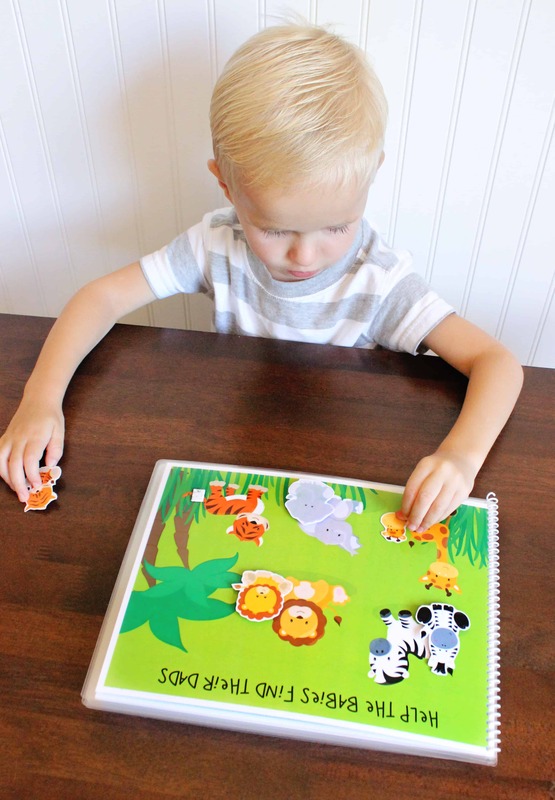 How many tigers are there in this book? You can join the THOUSANDS of families who have enjoyed our books via instant download by getting it direct from our website by clicking here or from our 5-star rated Etsy shop, which you’ll find here. « Camping Hacks: 8 Tips and Tricks You Won’t Believe You Lived Without. Hi, I want to get this printable . How can I ? Kindly help. 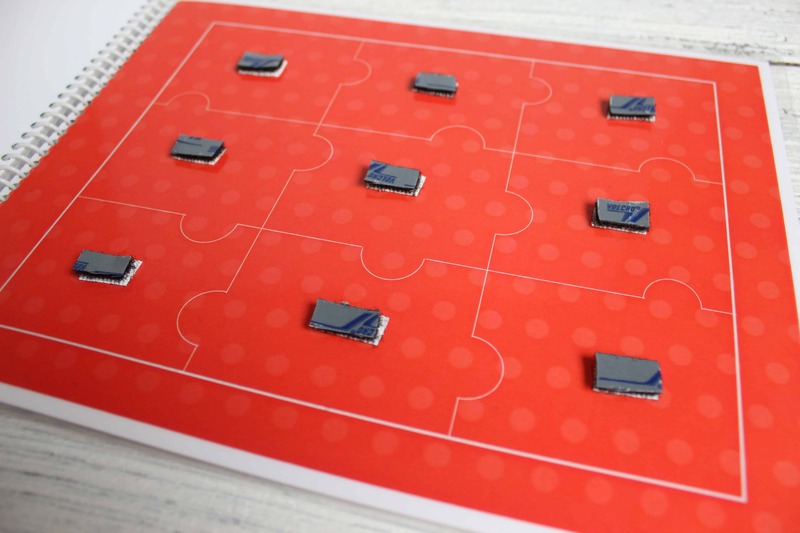 Hi, I am from Romania and I want to get this printable,please . How can I ? I love these!!! I was trying to find something easy to put together for my grand kids for a car trip. They were easy to download and print. And having a Bible book sealed the deal! Thanks so much! I would love to print off this cute book. I can’t find the link to download the PDF.